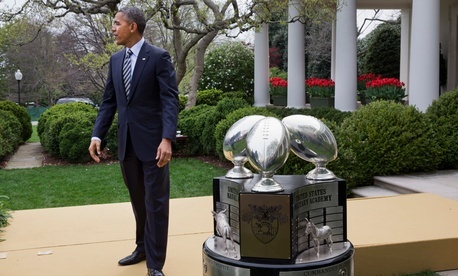 Obama has remarked on safety in football before. Last year, he told The New Republic, "I think that those of us who love the sport are going to have to wrestle with the fact that it will probably change gradually to try to reduce some of the violence." In a conversation with The New Yorker in January of this year, Obama saidoutright, "I would not let my son play pro football." The complaints over safety aren't coming out of nowhere. In August 2013, under national scrutiny, the NFLsettled a lawsuit brought against it by former players for $765 million. The sum will be applied toward medical exams and research, litigation expenses, and compensation for affected players. Most recently, the football team in Washington has been under fire for refusing to change a name that is aracist slur. A band of 50 Democratic senators came together to sign a letter sponsored by Sen. Maria Cantwell, D-Wash., urging the commissioner of the NFL, Roger Goodell, to throw his weight behind a name change for the team. Tweet: @SenatorReid to show your #RedskinsPride and tell him what the team means to you. Once an escape from politics, football—the most popular sport in the U.S. for the 30th year running—is becoming increasingly tangled up with a Congress suffering from record-breaking low approval ratings. The pace only seems to be increasing: The government and the NFL may remain strange bedfellows for some time.